There are no pool cleaning kits anywhere as good as this one. I would go so far as to say this is the best pool cleaning package you can buy. Whether for an above-ground or inground swimming pool, this maintenance equipment is what I use as a professional to clean swimming pools every day. Who am I? Just a 30-year pool service technician, what do I know? I sell two other pool cleaning kits for those not looking for the absolute best equipment. I have a 9-piece pro maintenance package that rivals most other packaged maintenance equipment for above-ground pools, Click Here. 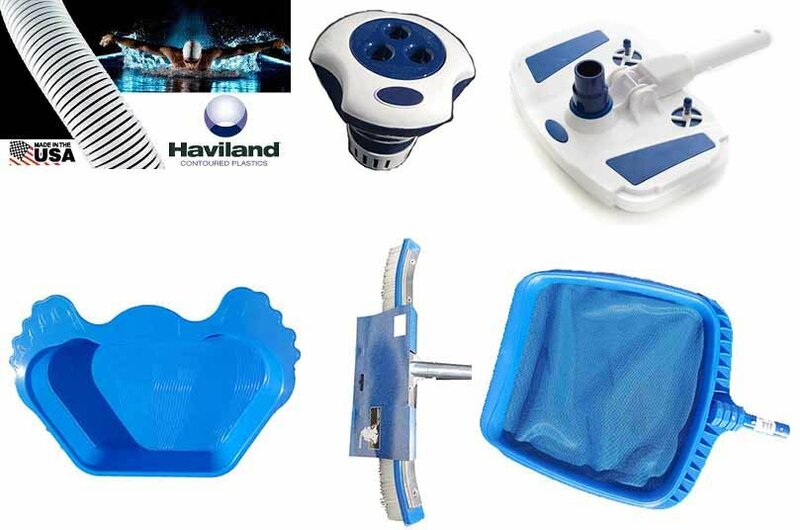 This maintenance package is suitable for any swimming pool type or size, though it does not include a traditional vacuum head or brush for cement swimming pools. I feel maintenance people that use metal brushes on gunite/cement plastered swimming pools are doing a disservice to their customers or looking for replastering work. I sell the Haviland I-Helix Vacuum Hose separately and have gone into great detail as to why it is the best, so I won’t go into it further here. You select the vacuum hose length before adding this package to your cart. I even wrote a review of pool vacuum hoses; you can see that if you Click Here. Reinforced bristle wall and floor brush for cleaning and brushing pool surfaces. Leaf net to skim dirt and debris from the pool water surface or off the bottom of your swimming pool. Weighted Vented Vacuum head with a bottom and side bristles (not shown in image). This tool is my preferred swimming pool vacuum with sturdy, flexible handle. This vacuum head comes in handy when opening pools with a lot of algae on the floor. This tablet erosion dispenser is my favorite method of maintaining a residual amount of chlorine in the pool water. Just be sure to remove it before using the pool, and make sure it does not get stuck in one area too often. It has a dial on the bottom to dispense more or less chlorine. Not many people have a shower handy, but with the foot bath, you can keep grass and dirt from going into the pool. I used to sell just my nine-piece pro maintenance kit as I felt it was better than most if not all other kits. Then I realized I didn’t use anything that came with that cleaning kit, I thought I owed it to you to put a package together full of the commercial grade pool cleaning equipment I use every day.